Generally, laptop and computer speaker are louder than the built-in speaker that comes with the iPhone. So if you ever find yourself in a situation where you would rather use your laptop speakers rather than the iPhone speaker to listen to music stored on the iPhone or iPad, you don’t have to transfer songs from from your iPhone to your computer to do this; something which is way more complicated. You can simply wirelessly stream the songs from your iPhone, iPad, or iPod touch directly to your computer. 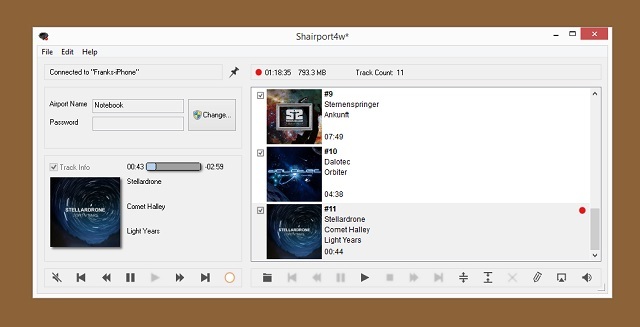 Download and install Shairport4w (from lightweightdream.com) on your PC. Connect your iPhone, iPad, or touch to the same WiFi network as the PC on which you wish to use as a wireless speaker. Go to the app you use to play music on your iPhone (Music, Spotify, etc), play a song and change the audio source to the Airport Name shown on the Shairport4w PC program. That’s it. All song/audio played on your iOS device will now be streamed and played on your computer’s speakers.